A few months ago, gun control was a rare discussion at the dinner table, on the news, or around the water cooler. It felt like the winds had changed and we were heading for calm waters. Then a storm erupted, and now gun control seems to be front and center on everyone’s mind. The tragic misguided actions of a few disturbed people have turned the spotlight on us, the legal, responsible, safe gun owners and firearms enthusiasts of America. Unfortunately, that spotlight is full of misguided rage and ignorance. Our blog has a new home. You can continue reading this article on our new blog. Click here to visit. Just like every healthy family, we're growing. And, like every family that grows, we've been looking for a new home. To visit our new home, just click here. Obviously, you'll be able to continue following us on Facebook, Twitter and YouTube. To make sure this transition is smooth, we will continue posting an introduction to our new posts, from time to time, right here on this blog. If you like what you read, all you have to do is click on "CONTINUE" to read the full article. Our blog will continue to provide informative and entertaining details about the wonderful life behind the Second Amendment. 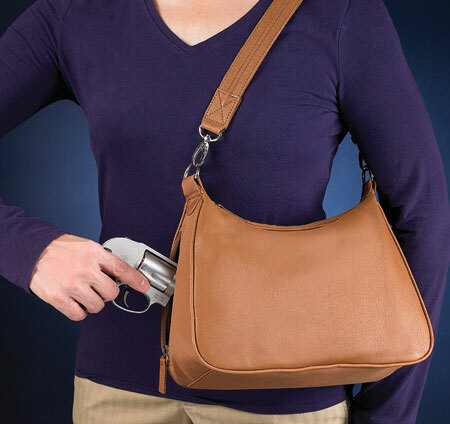 The Concealed Carry Purse, people either love them or they hate them. 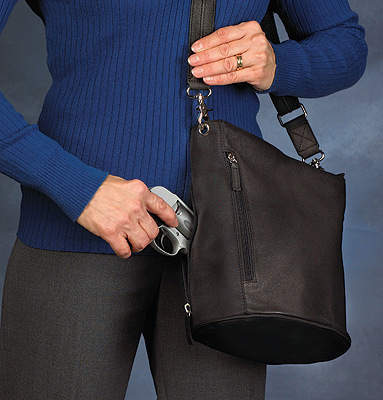 To carry your firearm in a concealed carry purse is your decision to make and there is no right or wrong answer. What there is though, is what is recommended. You are an intelligent woman who can consider all of the information, the risks and the pro's and con's and make an intelligent decision for yourself if a concealed carry purse is right for you. Why do so many fiercely counsel against this popular mode of carry? Likely for two reasons. One, there is serious risk anytime our guns are not on our bodies and two, it limits our ability to respond as quickly as possible and those seconds could count! These are very real issues that must be considered and consciously accepted by you when making the decision to holster your gun in a concealed carry purse. I trust you will do this. I know myself - I know my capabilities - and I practice. Having your gun holstered somewhere ON your middle is BEST. It is close, it is safe and it easy to get to. You really can't argue with that. On The Body is the safest and best way to carry your gun, Period! Can you carry safely in a concealed carry purse, yes you can. The proper purse, meticulous awareness, and practice drawing/shooting from one is the key. Have I left my purse behind in the last 6 months, in the restroom, a restaurant or store? Am I around small children regularly who might have access to my purse? Am I willing to carry my purse cross-body to minimize risk of someone taking my purse? Can I keep it on me and store it properly when it must be off my body? Will I vow to always have my gun in a holster in a designated compartment of the purse? These are just a handful of important questions to ask yourself. It is your decision, one that it is important you make honestly and thoughtfully. If you can't answer these questions with confidence, than even if you think this is the best option for you because of the convenience, it likely is not a good choice for you. The word 'gun' conjures up different images, depending on who is thinking it. 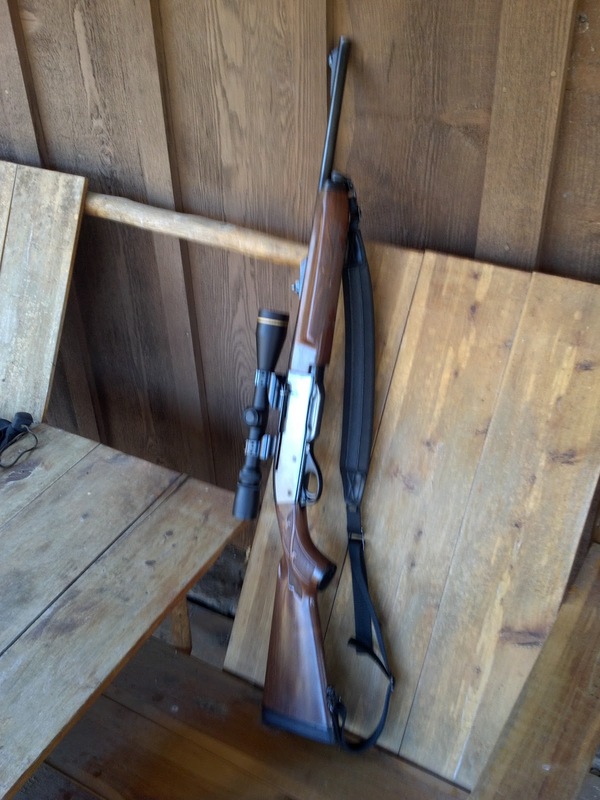 We think of guns as tools of the trade, as hunting implements, as devices for our hobbies. READ THE REST OF THE STORY IN OUR NEW BLOG HOME. CLICK HERE. I wanted to speak to you, the American woman gun owner, face to face. The looming changes and restrictions to our rights to to be able to match the weaponry of the violent criminal who wants to do us harm are coming. As women - we already have the disadvantage, the application of the proposed legislation would leave us ill equipped and on an even more un-level battlefield. I believe the path we as a nation are about to head down leaves us extremely vulnerable to more restrictions that will jeopardize our Second Amendment rights. Now is the time for us, collectively, the millions of women like you and me who exercise our right to defend ourselves, our loved ones and our homes, to enter this debate with passion and might. Thank you for listening and uniting to effect policy. I was diagnosed and treated for a rare muscle tumor when I was 17. The cancer was so rare that I was only the 7th person diagnosed with it and the first person to ever survive it. I was sent to St. Jude Children’s Research Hospital in Memphis, TN which is an awesome hospital and I strongly recommend that you help support they hospital with donations or fundraisers. I spent 6 months in treatment and have been in remission since December of 1997. Eventually the side effects of the radiation treatment set in and the scar tissue in the radiation area set up like concrete. I reached the point where I couldn’t move my left hip or knee. I walked with a very pronounce limp. In March 2010, I broke my bad leg. My femur snapped where the good bone and the irradiated bone met and the bad bone shattered into 3 pieces. Two years, ten months, two surgeries, a bone graft and two titanium rods later (the first non-slip rod slipped), and I am still on crutches and will be for the foreseeable future. The bone started mending after the second surgery but the healing is slow due to the poor circulation in the radiation area and also due to the poor condition of my femur bone. The doc was shocked when what looked like dead bone started healer. I guess it was just mostly dead. Thanks to God for the miracle of the human body. I’ve told you all of that so that you can know that I know what it is like to live with a physical disability. As you know from my previous posts Crutching Around With A CCW and 3 Problems With Carrying A Gun While On Crutches I now have a concealed carry permit and have been working out the best way for me to carry a concealed weapon. Don’t Let Someone Else Tell You What Is Best For You – talk to people, get opinions but when it comes down to it, you need to carry what works for you. Don’t let someone tell you that you should be carrying a .45 for the stopping power when your arthritis will barely let you use a .22. The choice of a carry pistol has to be what works best for you. When is comes to how you will carry concealed, you will need to figure out what works best for you with that too. In your case, a lot of the recommended conceal carry techniques and holsters may not work for you. Don’t let someone else tell you what is best for you. You need to work it all out in a way that best suits your needs. Practice Your Way – Once you have the best method that fits your situation, practice, practice, practice. This applies to everyone but more so to someone with a disability that might impede their ability to draw their weapon. Sorry but that’s just the way it is. Don’t Carry a Gun – I know that sounds radical but hear me out, if your disability doesn't allow you to draw or shoot your pistol or allows an attacker a more than average chance of taking your pistol away from you, don’t carry one. You are responsible to be able to defend yourself and your loved ones. If your disability makes carrying a pistol a danger to others either by your inability to fire the weapon safely and accurately or by the potential of your weapon being used against others then you should seriously consider not carrying a pistol. Instead, you could carry a knife and tactical flash light. In a pinch, those two items are quite effective. I am not sure where I heard this saying but is has stuck with me (I am paraphrasing): Someone can take a gun away from you without getting shot, but no one can take a knife away from you without getting cut. What do you think? Anyone else have some tips that you want to add? Check out www.BeretttaUSA.com and make sure you follow Beretta on Facebook, Twitter and YouTube. 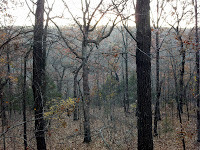 When it comes to going out into the woods, there are some items that you really need to have with you no matter what, like matches, water, knife, flashlight, etc. 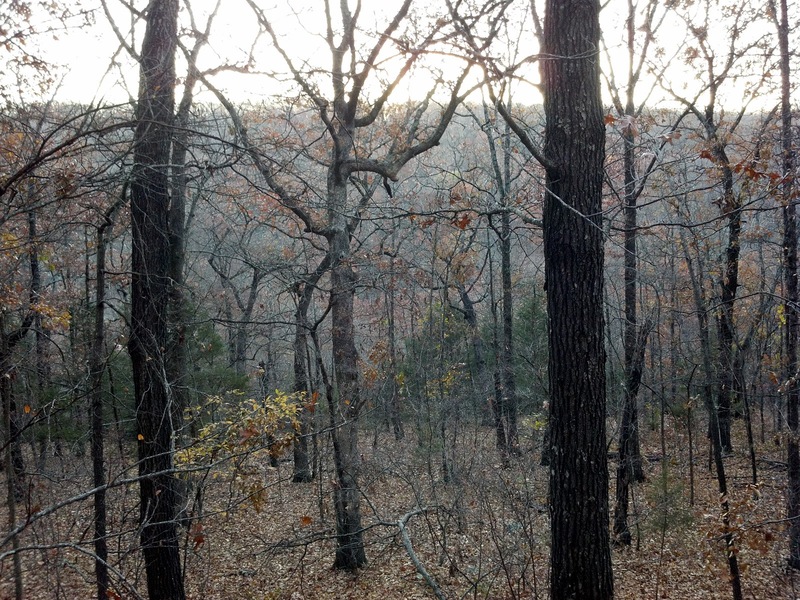 When it comes to hunting, that list gets expanded somewhat. I feel that I pack like my wife when I venture out into the deer woods. Then I see all the stuff my friend Boone takes with him and don’t feel so bad. Here is a list of what I carry with me when I go deer hunting. READ THE REST OFTHE STORY IN OUR NEW BLOG HOME. CLICK HERE. Copyright (c) 2011 Beretta USA Corp. Watermark theme. Powered by Blogger.